As I mentioned in my previous post I got myself a halogen oven and I’m happy like a pig in the mud 🙂 For over 18 months I was suffering cos couldn’t bake, I even found recipe for great pizza from the pan, people was saying how can I handle and I said it’s hard but manageable – I simply had no choice right? But at the first occasion I got an oven that is portable and easy to maintain. Just had to learn how to use it, cos it’s a little different then regular oven. Everything needs to be done in a lower temperature or covered. Cookies even went as far as purchasing couple e-books written by Sarah Flower, who explains the basics of halogen oven cooking and baking. But it is now and in the beginning I was experimenting on my own what resulted in few nice dishes and bakings. Today I would like to share an easy and if you don’t use white sugar, relatively healthy (includes white flour though) pastry. If you feel like washing grinder – grind the cheese, but mashing it by just using potato masher works fine. Add one egg yolk, sugar and cinnamon, mix good. Make sure it’s as sweet as you please. Add butter, salt and flour and stir until you will get flexible dough. Use your pin roller and flatten it to ½ cm thick, cut desirable squares from it and place on the greased wax paper. Place in the hot oven. Bake it 10-15 minutes at 180C. If it’s halogen oven – bake on the lower rack and when cookies are browned flip to brown the other side. Serve sprinkled with some brown sugar/fructose and cinnamon. P.S. Cookies thoughts: To her credit, she was experimenting a lot, and I got to say it turned out good. The oven takes a little of getting used to, familiar with, but this was a solid bakery like effort. 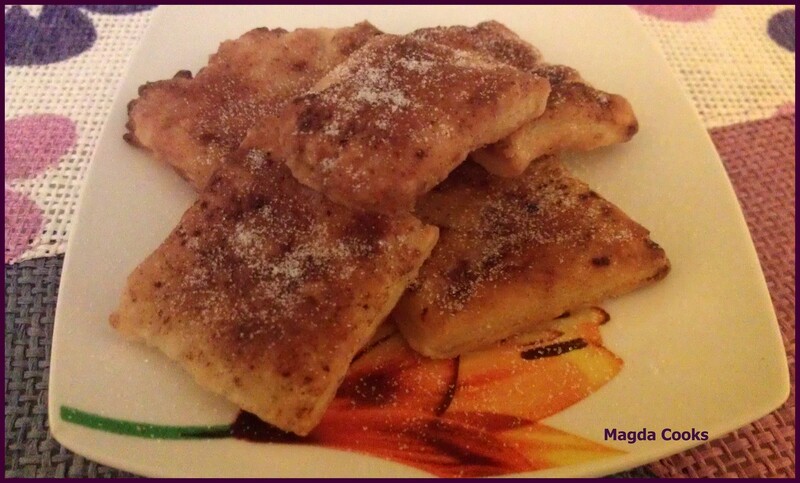 Magda Cooks… it just right!